The economy of the US state of Colorado according to The Bureau of Economic Analysis gross state product estimates for 2008 was $248.6 billion. The Colorado economy ranked 20th largest in the United States in 2008. per capita personal income in 2003 was $34,561, putting Colorado 8th in the nation. The state's economy broadened from its mid-19th century roots in mining when irrigated agriculture developed, and by the late 19th century, raising livestock had become important. Early industry was based on the extraction and processing of minerals and agricultural products. Current agricultural products are cattle, wheat, marijuana, dairy products, corn, and hay. In the second half of the 20th century, the industrial and service sectors have expanded greatly. The state's economy is diversified and is notable for its concentration of scientific research and high-technology industries. Other industries include food processing, transportation equipment, machinery, chemical products, minerals such as gold and molybdenum, and tourism. Denver is an important financial center. The booming state capital Denver is the economic center of Colorado. As of August 2013, Colorado had 53,800 nonmilitary federal employees, which made of 2.3 percent of the state's total nonfarm employment, slightly above the national average of 2.0 percent. In addition, there were 37,285 active military in Colorado. Before Colorado was a state, it was a federal prison territory. Today, the Federal Bureau of Prisons operates the Federal Correctional Complex, in Fremont County, which consists of several separate Federal prisons, including ADX Florence, the only supermax facility in the federal system, home to many convicted terrorists and other notorious criminals. The North American Aerospace Defense Command (NORAD) and United States Air Force Academy are based in Colorado Springs; National Oceanic and Atmospheric Administration (NOAA), National Center for Atmospheric Research (NCAR) and the National Institute of Standards and Technology in Boulder; United States Geological Survey and other government agencies at the Denver Federal Center in Lakewood; the Denver Mint and United States Court of Appeals for the Tenth Circuit in Denver. There is also a significant amount of federal lands in the state, including 11 National Forests and four National Parks. There are also numerous private companies that have operations in Colorado that deal with the governmental agencies in states. 17th Street, dubbed the "Wall Street of the West," is home to many of Denver's banks, corporations, and financial agencies. Denver's economy (Denver is the Rocky Mountain region's most populous city), is based largely on its geographic position. The Denver metropolitan area is the largest in the area (the nearest metro area of comparable size is the Kansas City Metropolitan Area about 600 miles east). Denver is the location of federal, high-tech, educational, commercial, financial, cultural, tourist, storage, and distribution services to the Rocky Mountain States. The city is also home to several large corporations in the central United States. The Wells Fargo Center (also known as "The Cash Register Building") in downtown Denver. Many federal agencies are based or have offices in the Denver area. In addition to federal agencies, there are many companies based on federal defense and space projects. Lockheed-Martin and Ball Aerospace & Technologies Corp. are examples. Being the capital of the state of Colorado also gives many state jobs to Denver. Denver's position as the largest city in a mineral-rich and fossil fuel-rich area leads mining and energy companies to maintain offices in the metro area. In the early days of the city, gold and silver booms and busts played a large role in the economic success of the city. In the 1970s and early 1980s, the energy crisis in America created an energy boom in Denver captured in the soap opera Dynasty. Downtown Denver was built up considerably during this time; many new downtown skyscrapers were built. Eventually the oil prices dropped from $34 a barrel in 1981 to $9 a barrel in 1986, and the Denver economy dropped with it, leaving almost 15,000 oil industry workers in the area unemployed (including mayor John Hickenlooper, a former geologist), and the highest office vacancy rate in the nation (30%). Energy and mining are still important in Denver's economy today, with companies such as Newmont Mining, Patina Oil and Gas, and Antero Resources. Denver's west-central geographic location in the Mountain Time Zone (UTC −7) also benefits the telecommunications industry by allowing communication with both North American coasts, South America, Europe, and Asia in the same business day. Denver's location on the 105th meridian west at over 1 mile in elevation also enables it to be the largest city in the U.S. to offer a 'one-bounce' real-time satellite uplink to six continents in the same business day. Qwest Communications, EchoStar, Starz-Encore, and Comcast are just a few of the telecommunications companies with operations in the Denver area. These and other high-tech companies had a boom in Denver in the mid to late 1990s, but the technology bust in the new millennium caused Denver to lose many of those technology jobs. Recently the Denver area has started making a comeback, with the October 2005 unemployment at 4.7% the lowest since September 2001. Denver government and industry leaders are attempting to diversify the Denver economy so that it is less susceptible to boom and bust cycles. 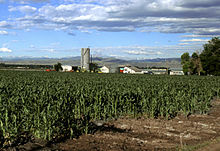 Colorado has a large agricultural market. Colorado's ranchers and farmers receive average payments per year totaling $316 million from the federal government including wheat subsidies averaging $79 million a year, corn subsidies averaging $78 million a year, total conservation-reserve acreage payments of $75 million, livestock and dairy subsidies of $10 million, and disaster payments totaling $47 million. ^ "Total Gross Domestic Product for Colorado". fred.stlouisfed.org. January 1, 2017. Retrieved June 1, 2018. ^ "Per Capita Personal Income in Colorado". Research.stlouisfed.org. March 28, 2016. Retrieved December 23, 2016. ^ "American FactFinder - Search". Factfinder.census.gov. Retrieved December 23, 2016. ^ "??" (TXT). Research.stlouisfed.org. Retrieved December 23, 2016. ^ "Colorado Economy at a Glance". Bls.gov. Retrieved December 23, 2016. ^ "US Census Bureau, State Government Tax Collections Viewable Data". Factfinder.census.gov. Retrieved December 23, 2016. ^ "Gross Domestic Product (GDP) by State" (Press release). Bureau of Economic Analysis. June 2, 2009. Retrieved April 20, 2010. ^ a b "Colorado economic output GDP". EconPost.com. January 20, 2010. Retrieved April 20, 2010. ^ Federal employees by state, Governing Magazine, accessed 29 March 2016. ^ Wilson, James A. (January 1, 1980). "Frontier in the Shadows: Prisons in the Far Southwest 1850-1917". Arizona and the West. 22 (4): 323–342. JSTOR 40168971.